iconic hobbyists not come to give your Sims hobby club membersip cards or special plaques. noRewards â€“ Sims do not get special plaques, or hobby club membership cards due to a high level of enthusiasm for a hobby (they still can get those cards at work or at school), no dialogs appear. 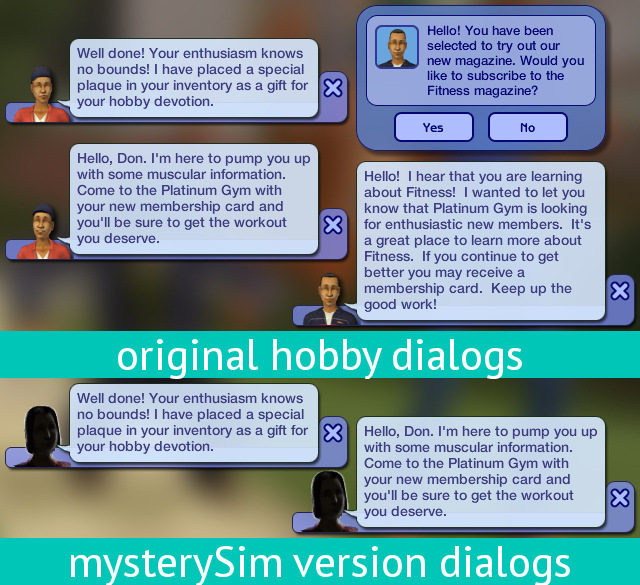 mysterySim â€“ Sims still get the above rewards: no one comes to give those, only dialogs spoken by a "mystery Sim" appear. Use only one version at a time. If you're interested in using an unpopulated version of the Hobbies neighborhood, see the Clean and Empty Stealth Hood Templates by Jawusa. NoHobbySpam by Pescado conflicts with this mod. Among other things, it prevents iconic hobbyists from coming but does not prevent them from being created to display dialogs. This mod must load after Pescado's to work properly. No Hobby Instructors Regen by Midge the Tree has an effect similar to this mod and they conflict with each other. Don't use them together. No Random Calls (Subscriptions) by Cyjon and No Incoming Call (Hobby Level 2, Hobby Magazine Subscription) by ChristianLov don't conflict directly with this mod but they become useless, as those mods "remove" calls right after they appear, while this mod prevents the hobby-related functions from creating new calls. 105 people have said thanks to Nopke for this download.